The Men's NetWork was inspired by the robust participation for our first GIVES BACK event. Held between Thanksgiving and Christmas of last year, we encouraged men's groups to reach out and help those who needed it during the holiday season. It was a chance for guys to pay it forward in response to all the blessings they receive from God through the year. Our suggestion list included things like giving back to a men's or women's shelter; offering car winterizing services; helping out at a veterans hospital; or providing toys to kids who wouldn't get them. To put a bit of healthy competition into the GIVES BACK event, we included a little contest with three winning categories: 1) most creative service idea; 2) most community-oriented project; 3) best "holiday-themed" dressed group. Winners in each group would receive $150 Amazon gift card to use how they choose. We received some excellent entries and saw some great work accomplished; we also came away with three distinct winners. For the most creative service idea, the winner is the Men Celebrate Jesus from Celebration Lutheran Church in Seymour, Tennessee. 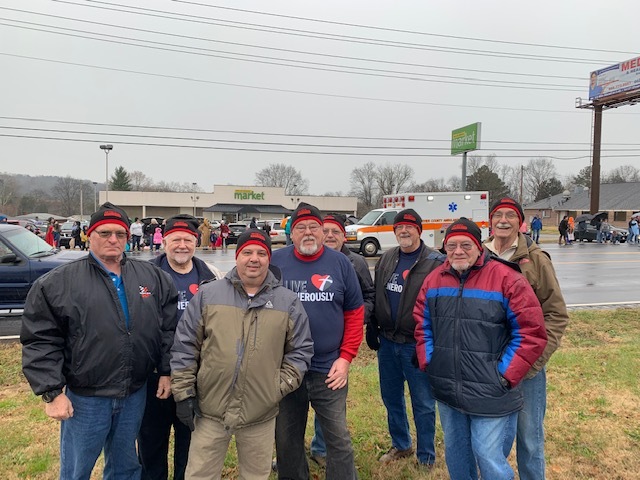 Dean Hempel writes, "Since our church is located on the route of the Annual Seymour Christmas Parade, we decided to take advantage of the traffic and exposure to our community. This year was the 25th annual parade to benefit local families in need. Teachers selected families based on their familiarity with students in the community. Our men's group, Men Celebrate Jesus, decided to have canopies and tables along the parade route and serve up some brats, hot dogs, and kraut to help raise funds for the same cause. Local business participation helped with food and publicity. This event helped share the Good News of Jesus in our community, provided an outreach for our church, and served those less-fortunate families in our community." Hempel noted the unofficial tally showed that more than 80 families had been assisted and at least $500 had been raised. The winner of the most community-oriented project was Concordia Men's Ministry at Concordia Lutheran Church in Kirkwood, Missouri. 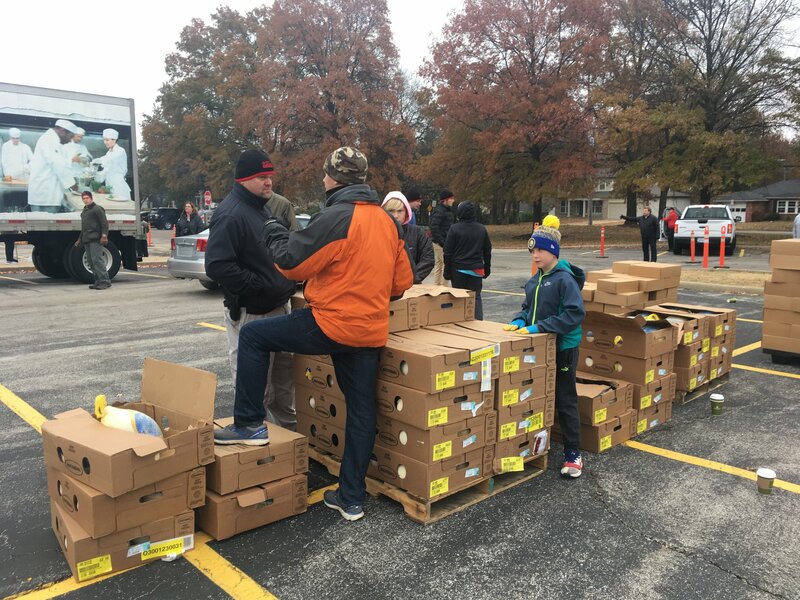 For the fourth year, the group's "Turkey Blessing" made a huge impact on families in the St. Louis area through its distribution of 1,000 Thanksgiving dinners (frozen turkey, stuffing, green beans, gravy and potatoes). The event had the markings of a well-oiled machine. More than 200 volunteers helped with the packing, hauling, and delivery of the dinners. One-on-one connections took place with volunteers interacting with drivers and passengers waiting in line and even offering to pray with them, if requested. Beyond the 1,000 meals given away by Concordia, 250 more were given to four other St. Louis organizations: All Nations Church in University City, Christian Friends of New Americans, Caring Ministries, and People of the Book Lutheran Outreach. One of the group's volunteers said, "I was really impressed by the ministry taking place alongside the vehicles; people received more than turkey and trimmings that day." The best "holiday-themed" dressed group went to the men and women volunteers of Shepherd of the Hills Lutheran Church in Horseshoe Bend, Arkansas. Their Men's Prayer Breakfast Group joined local and church volunteers to do the "Community Christmas Basket Project." "These folks wrapped gifts for 314 children and packed food baskets for 146 families in the Izard County area," said Rev. David Tews. "The group then distributed them to area schools and homes. We gave out the black-knitted GIVES BACK caps to the volunteers, and the local Roman Catholic priest, a native of India, wore his in the food-boxing assembly line. More than 30 people participated, and another group delivered them later that week," he added. As you can see, this crack team of volunteers showed some lively Christmas spirit and sported not-a-few sweaters, scarfs, reindeer antlers, and stocking caps as befit the season. Needless to say, the gentleman at left stole the show with his finely tailored suit of festive colors, matching trousers, and splendid necktie. Our thanks to each and every group that took time to participate in the Men's NetWork GIVES BACK event. The weeks between Christmas and Thanksgiving are busy for everyone, but what a difference it makes to take some time and help those who could really use a blessing during that season-and a chance to experience the love of God in action.